Hi Everyone! 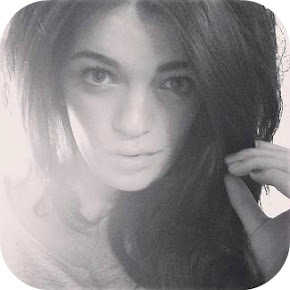 I haven't got round to blogging for over a week! I've been so busy getting ready for my holiday which is now only just around the corner. I took myself to Westfield in Stratford throughout the weekend and popped into MAC just to buy myself some foundation. What ended up happening was ridiculous, as I ended up coming out of the store with a bag full of goodies including the cremesheen lipstick in the shade Shy Girl. I met Amy Childs last Wednesday at her perfume launch on Oxford Street and I loved the lipstick she had on. I asked her what it was and turns out it was from none other than trusty MAC! Alot of people are somewhat dubious as to why you would spend £14.00 on a lipstick, but my MAC collection has never failed me. I love the cremesheen range as they add the perfect amount of gloss without becoming sticky and have a fantastic formula which means there is extra staying power and it never budges out of place. The only thing I probably dislike is the smell. It has that awful smell of chemicals which is really off putting, especially first thing in the morning. I was also looking through my make-up box a few days back (yes a box. I don't do make-up bags) when I came across a lipstick I'd forgotten I owned and hadn't even opened. To my horror, the shades were practically identical. I purchased 'Pumpkin Pie' a few months back for no more than £3.00 and although the formula doesn't quite match up to MAC's Shy Girl, it's still a lipstick I could use on the go. I'm an absolute sucker for nudes and pale pinks, so for colour this definitely gets a 10 out of 10 from me! Pumpkin Pie is a very subtle colour, and isn't nearly as pigmented as Shy Girl as I found myself applying up to three coats to achieve a similar colour. It didn't glide on as easily as Shy Girl, but for only £3.00 it's hard to justify why I can't use my NYX more often. It contains a small amount of gloss, again not too much that it's sticky and sits awkwardly on my lips. I did find that after a few hours that the cracks in my lips were beginning to show but it was easily fixed by a quick top up. 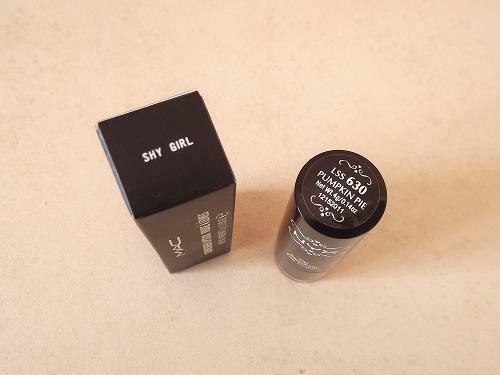 For packaging, I obviously completely prefer that of MAC's Shy Girl. 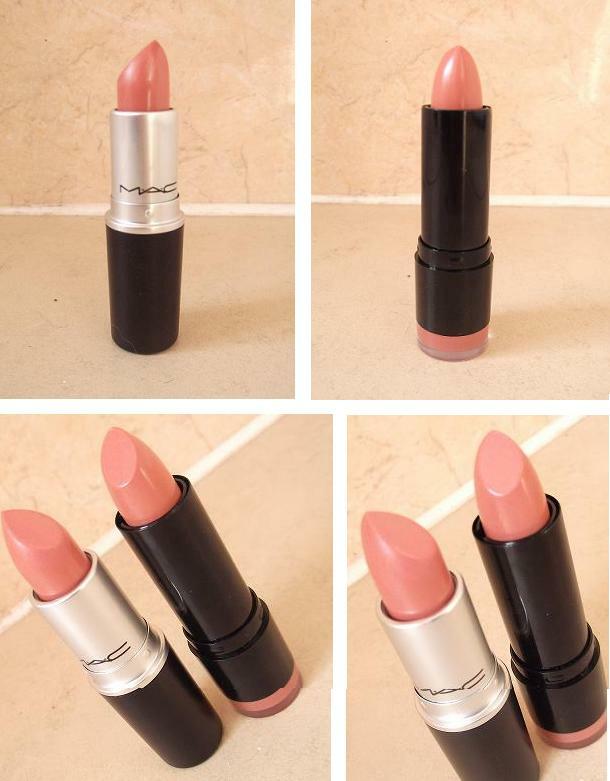 All the lipsticks from MAC are so sleek looking, and I can't help but think Pumpkin Pie is a little tacky looking. 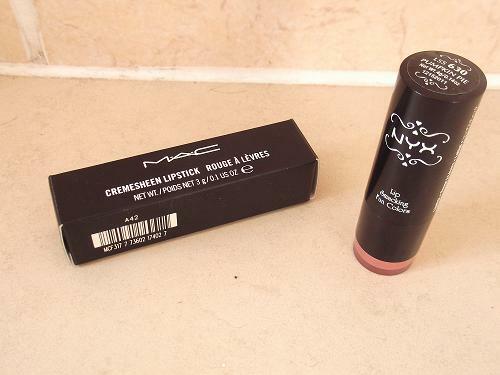 It will be absolutely perfect to replace my Shy Girl lipstick when I go on holiday as I'm so clumsy and will probably end up dropping my MAC into the sea! I've bought a load of drugstore lipsticks recently for this purpose and may post a small haul showing you all what goodies I've managed to find. 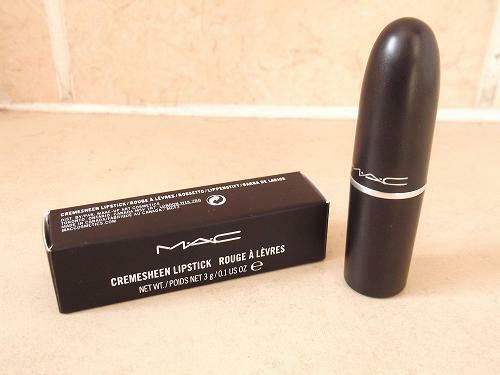 Do you own any MAC Cremesheen lipsticks? Which is your favourite shade?